Just when you thought you got away from Chael Sonnen’s nonstop chatter, Spike TV enters stage left with “Countdown to UFC 117.” The hour-long documentary debuts this Monday, August 2nd at 11PM ET/PT on the edgy network. The show will spotlight the middleweight title fight between reigning king Anderson Silva and the talkative challenger that resides out of Team Quest in Oregon. Sonnen has done more than his fair share to sell the scrap thus far, however you best believe he’ll be locked and loaded with instant classic one-liners once the cameras start rolling. 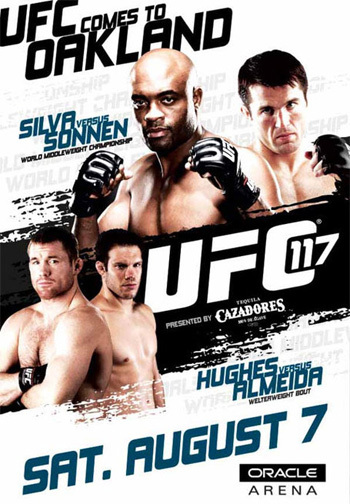 “UFC 117: Silva vs. Sonnen” will be jumping off inside Oracle Arena in Oakland, California on August 7th. The pay-per-view broadcast will also feature the long awaited rematch between welterweight studs Thiago Alves and Jon Fitch, as well as a heavyweight top contender matchup between Junior dos Santos and Roy Nelson. Replays of “Countdown to UFC 117” will air August 3rd (1AM ET/PT) on MTV Tr3s, August 4th (8PM ET/PT) on Spike TV and August 5th (Midnight ET/9PM PT) on Versus.